Since its inception in 2014, the Government of Ethiopia and a number of international conglomerates have been anticipating the kick-start of the multimillion project. The rise of renewable energy in Africa has opened doors for new technology to find its way in strengthening economies with a better methodology to curb divers challenges. Ethiopia, like most African nations, has been facing a huge barrier in waste disposal in Addis Ababa. The foul smell of mountains of waste has threatened the life of flora and fauna as well as residents. 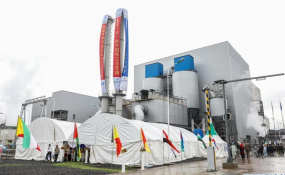 The incineration plant in Addis Ababa will transform the economic outlook of the nation, drive the ease of doing business in the environment. The facility will incinerate at least 1,400 tons of waste a day, converting the landfill into energy. The project dubbed as Reppie was constructed to spearhead the nation into a climate resilient green economy, as most European countries are. 30% of the capital's households will be supplied with electricity from the plant. This is the same percentage of the number of households that have access to electricity. The East African nation's $375 million Electrification Program which aims at powering its citizens by 2025 has been backed by World Bank which is one of the largest electrification programs in the continent by the international financier. The country's economic growth in 2018 was forecast to be 8.5%, probably a slight margin from the expected 10% of every year. To drive the economic prowess, the need for improved infrastructure and technology is a paramount requirement. Living standards should be improved, with employment opportunities provided to access labour force and generally contribute to the GDP of the country. A number of companies in the manufacturing sector will greatly benefit from this plant to improve their production. Reppie is a perfect model for other African countries which could be imbibed to improve the environment and open business opportunities for the local industry and lure potential investors to the various sectors.